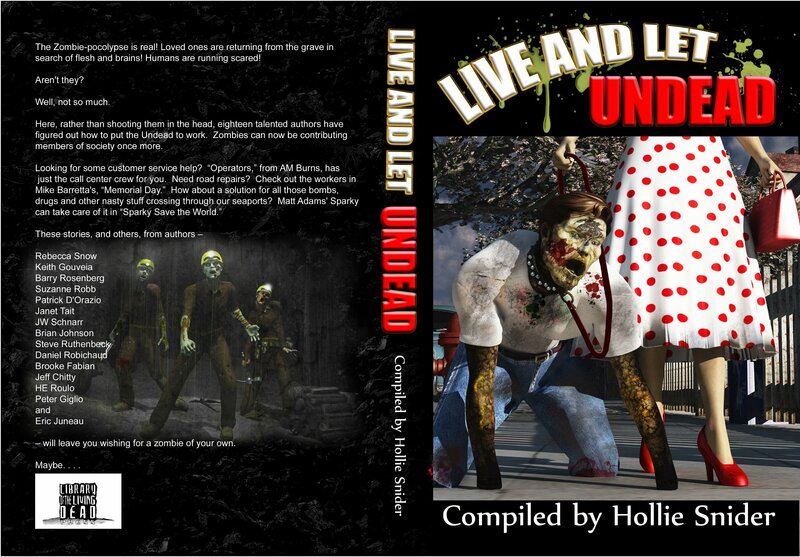 Cover for Live and Let Undead revealed. Well, I was going to wait until the official wrap around cover was released, but I decided I didn’t want to. There will be a few more tweaks to this one, but I love the artwork, and love my story that appears within its pages. The title of the book is Live and Let Undead, and as the back cover describes, it is a bit of a different take on the traditional zombie apocalypse story telling. More details to come on this anthology, and my short story “Legacy” as it gets closer to a release date. This entry was posted on August 27, 2011 by patrickdorazio. It was filed under Other folk's stuff..., The Shorts and was tagged with Apocalypse, comedy, cover art, horror, Library of the Living Dead, short stories, zombies. Hey Patrick! Nice sharing some between the covers time with you. Are you the creator of the cover? If so, my name has an e, it’s Brooke Fabian. If not, hell you can call me Brook. You can even call me Broke. Look forward to reading your story! Sorry about the typo. I didn’t create the cover…you probably want to give Hollie Snyder a heads up on any glitches with it. Looking forward to sharing a toc with you!